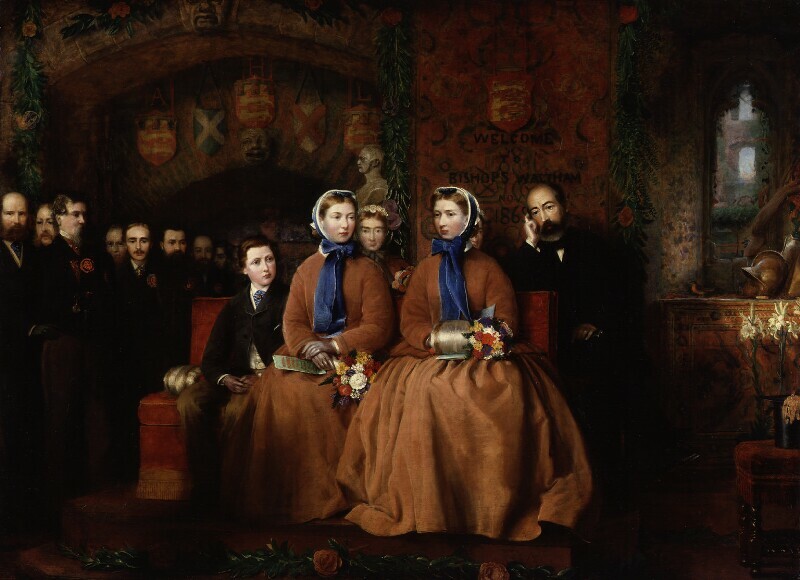 This portrait commemorates the opening of the Royal Albert Infirmary at Bishop's Waltham in Hampshire in November 1865. The three figures seated in the centre are Prince Arthur, Princess Helena and Princess Louisa, three of the nine children of Queen Victoria and Prince Albert. At the opening a statue of Prince Albert, who had died in 1861, was unveiled. The portrait depicts the sitters in the old abbey barn which was decorated as a concert-room for the occasion. In addition to the music, the leading actress Helena Faucit (later Martin) read scenes from The Merchant of Venice. Tickets were sold to the performance in order to raise funds for the infirmary.